100% Australian made and owned brand. Ideal for all breeds and sizes of kittens. 34% real meat proteins: From Australian chicken, vegetables and grains. 18% high quality fats: From a blend of healthy fats and oils, including Emu oil. High in vitamins B3 and B6 for vitality. Contains beet pulp for healthy digestion. 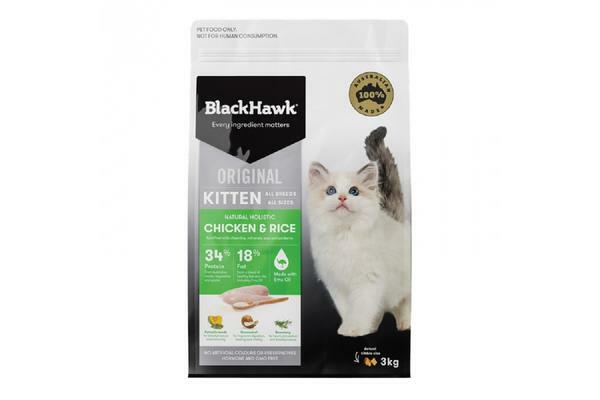 Black Hawk Feline Chicken Kitten is available in 1.5kg and 3kg sizes. Black Hawk cat food is 100% Australian made and owned. It is a super premium food that nourishes your pet’s health. Years of research, have enabled Black Hawk to create a diet that’s completely balanced and nutritious. Black, Hawk, is all about making sure cats get everything, they need,, and nothing they dont. Real meat, real veggies. No fillers, no nasties. Nothing but the best for our besties. The real food movement is all about eating food that improves our health, happiness and longevity. The original Black Hawk recipe was developed when a passionate breeder simply applied this thinking to their dogs diet. They relentlessly searched for ingredients that had a nutritional benefit and removed all of the ones that didnt. Other breeders quickly embraced the Black Hawk recipe for success. They could see shinier coats and happier, healthier dogs., The movement grew organically and soon the Black Hawk story was being passed from owner to owner. When it comes to healthy, happy pets , and even happier owners – every ingredient matters! Ingredients Chicken Meal. Rice. Vegetable Protein. Oats. Chicken Fat (preserved with Mixed Tocopherols [source of Vitamin E]. Rosemary Extract. Vitamin C). Beet Pulp. Salt. Egg Powder. Canola Oil. Chicory Root. Flaxseed. Fish Oil., Pumpkin Seed Powder. Alfalfa. Natural Antioxidants. Probiotic (Bacillus Coagulant). Coconut Oil. Yoghurt Powder. Emu Oil. Blueberries. Cranberries. Rosemary. Essential Vitamins ; Minerals.